The survey aims to build a resource about standard rates in the comic book industry for comic creators. Additionally, we hope that this data will encourage professionals not to accept work that pays below a living wage. The survey responses are gathered from comics professionals who choose to take the survey. The data is a based on a non-representative sample. There is potential for a self-selection bias, meaning those who choose to participate may be more likely to have certain perspectives or traits. Therefore, it is not representative of the population. That said, self-selection sampling is a widely used and accepted research method of non-probability sampling. The data was gathered anonymously from a sample size of 142 comics professionals. This data will be used as a resource in the process of being built. We are not drawing conclusions or interpreting the data at this point. The more people who participate, the more useful this data will be for all creators in the industry. All of our page rate information is in USD. If any publishers paid in a different currency that was noted, we’ve converted that to USD. 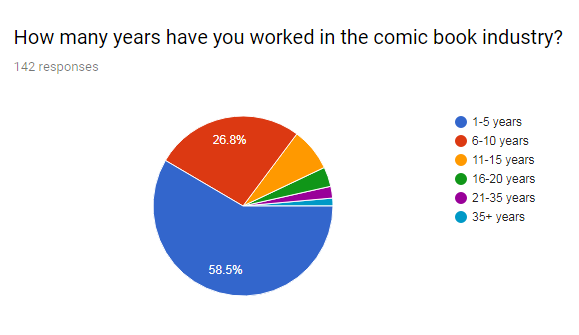 In addition to the page rates, we asked a few additional questions to gauge the industry a bit better including how long participants have been working in comics and what their primary sources of income within the industry are. All of this is found in our compilation of the data below. *This rate was an exception from the norm we noticed amongst the Marvel lettering rates. We have confirmed that the typical starting rate for letterers at Marvel is $23/page. Which publisher(s) did you work for in? Our survey participants cited working for the following publishers in 2017. Participants were allowed to mark down as many employers as they worked for in that year. The following publishers each had smaller numbers of people list them: Filthy Figments (3), Action Lab (2), Rebellion/2000AD (2), Space Goat (2), Archie Comics (1), Titan Comics (1), TO Comix (1), IDW (1), Kodansha (1). In what capacity did you work for one of the aforementioned publishers? What is your primary source of income within the comic book industry? Are there any particular publishers (or specific people at publishers) you don’t want to work for or are wary about? Some of the rates I’ve heard they’re offering are absolutely preposterous, especially on graphic novel projects and seem to take advantage of new creators. BOOM — takes months and multiple reminders to pay artists. Some shady stuff in their contracts, and sometimes tries to secretly annul contracts by slipping extra clauses into the fine print of their payment vouchers. BOOM. Aside from what I’ve heard from other creators, they offered me $30/page for complex colorist work for a licensed book on an extremely tight turnaround. BOOM! Studios. They really underpay and have been known to send incredibly late payments. BOOM – exploiting the gig economy to take advantage of newer artists, they don’t pay well, on time–or sometimes at all. At all costs, avoid working for BOOM. And if you have to, before talking to BOOM, get an AGENT and contact OTHER ARTISTS. The editors are not bad people, but professionally they have exploitative practices. BOOM isn’t completely awful – every editor I worked with was friendly- but their page rates/sketchy IP contracts make me wary of working with them again, especially on creator-owned comics. As much as I love the editors I’ve spoken to at BOOM their spec practices leave much to be desired. I have been asked to produce anything from 1 inked page to 2 full colour pages without any compensation as part of a test for a new or existing series. I’ve worked for BOOM on two projects, one in 2016 and one in 2017. In 2016, I was never given specs/templates despite asking more than once, and I ended up having to get those from someone else who had worked with BOOM, which struck me as annoying and unprofessional. They liked my work enough to ask to work with me again in 2017. I took it because working on that property was exciting to me. Again, I got very little details on specs or what the process was going to be. Communication issues frustrated me again (same editor as before) and I felt very lost. I’ve since been told by others who work in the industry that my rate was waaaay too low for doing both pencils + inking. I wish I’d worked with an editor who answered my questions, didn’t ghost my emails for literally months, and gave me more guidance on how the comics industry pipeline worked and what was expected of me, because I had no clue. Three people, in addition to the one below, had general issues that they wrote in with Dynamite. They did not elaborate. Dynamite Comics has reneged on a Writer Agreement deal I have with them and owe me upwards of $10K. Two people in addition to the one comment below reported issues when it came to working with DC COMICS. DC – only do work for them under a contract. It’s all spec otherwise. Five people in addition to the one comment below reported issues when it came to working with DARK HORSE. Three people in addition to the one comment below reported issues when it came to working with BLACK MASK. I’d be wary about working with BLACK MASK again. There was no editorial oversight on the book (and for team conflicts/scheduling reasons there really should have been) and getting me paid took the book’s writer personally hounding their contact at BLACK MASK after my emails went ignored for months, which was shockingly unprofessional. ACTION LAB: Kyle Puttkammer worked for Action Lab but is trying to find a new publisher. He’s terribly unorganized, forgetful, and I’m unsure if he’s aware of it or not but somewhat exploitative of young and new artists. Action Lab in general is a company I’d never work with again. I’ve had enough after 3 years. Action Lab. Terrible organisation, bullying publisher, and a misogynistic streak inside. Also they don’t offer comps. These are additional notes on all other publishers not mentioned above. They’re grouped here as we didn’t get as many notes on these publishers specifically. General warnings without any additional information were provided for Platinum Studios, Red King Press, Stela Comics, Space Goat, Avatar, Tokyo Pop, Bluewater, Antarctic Press, Zenescope, Lion Forge, and Vault. I worked with JOE BOOKS and it was a nightmare. Bad communication with the licensor of the properties they were doing led to far more revisions and headaches than there should have been (and much more than the rate merited), they were consistently late on payments, and they failed to include creative team cover credit despite it being prominent in the contract that they were required to do so. I stopped working with ZENESCOPE because they stopped paying me, and at one point owed me $4,000. Though it took the better part of a year of payment installments, they eventually paid me what I was owed. But I wasn’t going to give them the opportunity to do that again, so I stopped working with them. VAULT takes a long time and a lot of follow-up to pay. FANTAGRAPHICS BOOKS’ The Comics Journal has a lengthy editing process for the pay. One $50 article can take 3+ months to edit with no end in site or a clear kill fee. IDW PUBLISHING (high volume of work for low volume of pay, especially for tight deadlines). Have you ever faced any challenges in the comics industry because of your race, gender or sexual orientation? I’ve been let go for trying to add more queer content to an established mainstream series. It’s hard to tell from freelance when all work is over email, but people have definitely been creeps to me at shows. I (a woman) went through one instance of being preyed upon by an older male friend in comics. That experience made me much slower to trust industry men who offered praise or help. Other than that, no. The book I was working on for Portage & Main was shelved temporarily because it prominently featured women and “wouldn’t appeal to boys”. The editor I was working with worked to get that revered. Not me personally but I almost always get pushback on suggested collaborators & assistants on project proposals based on their identity rather than their proven talent and teamwork skills, no matter what it is. I’m a straight, white male and whenever I recommend a creator who is female or queer or a POC, the first question I always get asked is “Are they difficult to work with?” Yes, really. And when I suggest someone who is also a straight white male (which happens less often) I always get asked “Do you know anyone else?” Putting together the right team that meets the publisher’s approval can be a tiresome part of the process but I think it’s a necessary one. Yes. I have trouble meeting mentors because I don’t trust them not to try to take advantage of me. I have never been been hired by anyone but other queer people (often also POC and women), even though my work is pretty mainstream aside from my characters being more diverse than your average comics. I occasionally get bigoted comments on my social media or at conventions. Gender. More masculine leaning assignments given to men more unknown or untested men. Spent an awful lot of time getting walked all over at MARVEL and I suspect it wouldn’t have happened had I been a dude. I also suspect they would have chased after me more when I said I didn’t want to work for them anymore. I have found the culture at IMAGE very straight, masculine and off putting. I’m still pretty new in this industry so right now it’s hard to say. As a woman though I feel that it’s more difficult for us to garner respect as artists and connect with established professionals (mostly men) than our male peers, simply because of the culture. However, as a queer woman I’ve found a great community with other queer indie artists, and it’s at least a little empowering to see female/queer representation increasing in comics. Dismissive emails from senior males staff members of the publisher. Yes, while working behind a booth at comic cons, random attendees have asked to take pictures of me. I am not a cosplayer so it seemed odd to me and made me feel uncomfortable. I’m uncomfortable going to comic convention after parties since I’m a woman who doesn’t drink alcohol. Yes, I’m a QPOC and since that is omnipresent within my works it makes it difficult in a weird systemic way. Previous years, yes. 2017 was good though, but probably because I’ve been pickier about who I collaborate with. Breaking in as a black woman has been tough. I got my start in webcomics. I primarily work in children’s books (including graphic novels) now. I’ve had older artists tell me before that if women were any good at drawing comics, there would be more women in the industry. I’ve been in studios where male interns are paid* even if they are terrible interns, and invited to try inking things, while the female interns are basically ignored. The men all bond over bro-talk and I had to help the female interns myself. *garbage pay. Industry interns are almost never paid, and if they are it’s almost never well enough to buy a sandwich at the end of the day. But garbage pay vs no pay is still pay.I’ve had people make assumptions about my content because I’m a woman, though this has largely come from readers and not other pros. Within the industry, there doesn’t seem to much specific expectation for the type of work I would do. This is a shift from when I started, where every editor assumed I did manga or Sandman-type stuff without ever having seen my portfolio (my work is like neither of these things). No one presumes to tell me I’m pitching to the wrong company anymore. Are there any additional comments that you would like to make? I got most works from independent writers, Kickstarter and Webcomics. I charge +/-$110 for inked pages and $170 for colored pages. I was informed that First Second does not pay based on page rates, but by number of units they believe will sell. The length of the book does not factor in. My biggest recommendation to those looking to start, is to start. You can still create comics as fanwork or publish your own stories while attempting to find contractual, if not permanent, work through a publisher. You are not limited because you don’t have a brand attached to your work. Thank you so much for taking up the page rate survey. It’s a wonderful resource! I’d really like to know next year what pay rates are WFH vs Creator Owned and who is getting royalties.